Win a French glamping getaway! With a newly-opened second location in the sun-kissed Dordogne region of South West France, Glisten Camping can proudly claim to be one of the most stylish glamping set-ups around. Luxurious and well-located, their otherwordly structures offer an innovative new holiday experience. Think canvas spaceship that's fallen through a boutique furniture shop and landed smack in the middle of the beautiful French countryside. Think mini Eden Project that's traded flower beds for king-sized beds and migrated south for winter. Think... well, just think of a seriously cool glamping getaway. Whether you prefer Glisten's bucolic Basque bolthole in Col d'Ibardin or you fancy a spot at their newest Dordogne campsite, the choice is entirely yours, as we're giving you the chance to win a one week stay for up to 6 people at either of these top glamping destinations. And the best part is, courtesy of MyFerryLink and their Dover to Calais service, we're also throwing in your crossing to France absolutely free! To enter this competition, all you have to do is take THIS SURVEY. Your individual answers will be completely confidential, but we will share your email address with Glisten Camping and MyFerryLink who may contact you for marketing purposes. You can unsubscribe from those emails at any time. The competition closes at midnight on 2nd March 2015 and the winner will be picked at random. Full Ts & Cs below. Good luck! 3. Competition Details. All entrants must complete this questionnaire including all required fields, as outlined above. The content of the answers to the questionnaire will have no relevance or connection to the possibility of winning the prize. The competition will begin at 9am (09.00) on 23/01/2015. Any questionnaires submitted before this time will not be eligible. 3.1 The closing date for this competition is on the evening of 2nd March 2015 at midnight (00.00). 3. 2. Cool Camping accepts no responsibility for damage or loss resulting from misdirected or incomplete entries arising from computer malfunction, viruses, bugs or telephone malfunction or other such causes. Cool Camping are in no way liable for the reproduction or indirect access via third party web site or home page access which reproduction misstates or omits any of the information or terms and conditions connected with the promotion. 3. 3 The winner will be randomly selected by an independent judge up to one week after 2nd March 2015. 3. 4 The winner will be notified via email up to a week after 2nd March 2015. The name of the winner may be published on www.coolcamping.co.uk or associated social media pages from 2nd March 2015. The winner must confirm their acceptance of the prize within one week of notification, otherwise the prize will be offered to another randomly selected entrant. 4. Prize Details. 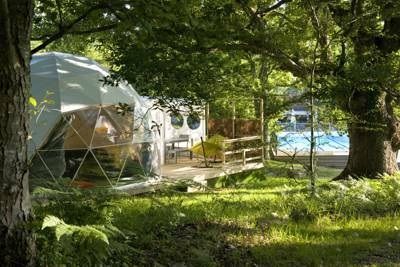 Prize consists of a 7-night stay for 6 people (including up to 4 adults) in a Glisten glamping dome at either of the two Glisten camping sites, Glisten Camping – Domaine de Mathévies or Glisten Camping – Col d'Ibardin, subject to availability. In addition, the winner will receive a free return ferry crossing from Dover to Calais courtesy of MyFerryLink. The winner may choose to redeem the Glisten glamping prize any week during 2015 excluding July 25th-August 29th 2015, subject to availability. If no suitable dates can be agreed for the 2015 season, it may be possible to take the prize during the 2016 season, excluding school summer holidays. Booking based on availability of Glamping domes. Glisten Camping's standard terms & conditions apply. Please contact Glisten for details. Prize does not include car travel to or from any of the locations, toll road fees or any other costs incurred, other than one standard return ferry crossing courtesy of MyFerryLink, subject to availability. MyFerryLink's standard T&Cs apply. Click here for full details. 5. 1 By entering this competition, the entrant is giving consent to be contacted for marketing purposes by Cool Camping, Glisten Camping and MyFerryLink in the future. Entrants may unsubscribe from these marketing emails at any time.